In the small mountain town of Yusuhara in Japan is a combo market and hotel inspired by the traditional “Chado" guest rooms and tea salons. Covered in thatch, the Yusuhara Marche is a nod to the past and to the present using traditional materials in a new and efficient way. 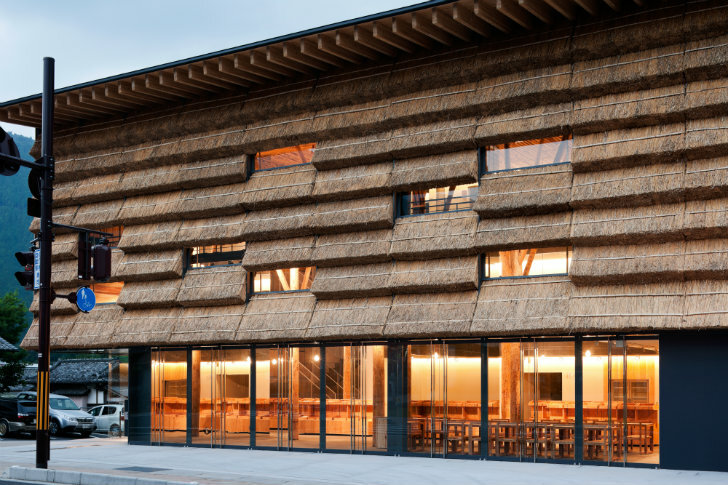 Designed by Kengo Kuma & Associates, the building's modular thatch panels form a well insulated curtain wall and operable windows allow for natural ventilation. Inside, a large atrium sells local produce, and in the back there are 15 hotel rooms to create a vibrant space for the town. Yusuhara Machino-eki is a multi-purpose building by Kengo Kuma & Associates that combines a local produce market with a small boutique hotel. The town was known for its location along a main road used by Sakamoto Ryoma, a high-minded warrior of the region who contributed to the initiation of the Meiji Restoration (big political reform). Along this road, there were a number of greenrooms called “Chado” for travelers, that served as cultural salons and where free tea was served. The Yusuhara Marche is an attempt to recreate that space where travelers and villagers could gather. Built using traditional materials like thatch, the market and hotel is directly inspired by the past, but with a distinctly modern design. Facing the street, the front curtain wall is built with modular thatch panels, tightly bunched together to create a solid wall of thatch. A deep overhanging roof will protect the thatch from rainfall and will ensure the facade lasts for a long time. These modular thatch panels are also built to pivot on a steel mullion so they can rotate and open the atrium up to the outdoors. Fresh air can move freely through the opened space. Inside, cedar logs are used as supports and the large open space is used by vendors to sell local produce. The back of the three-story building houses the 15 hotel rooms, which are simply furnished and naturally daylit. 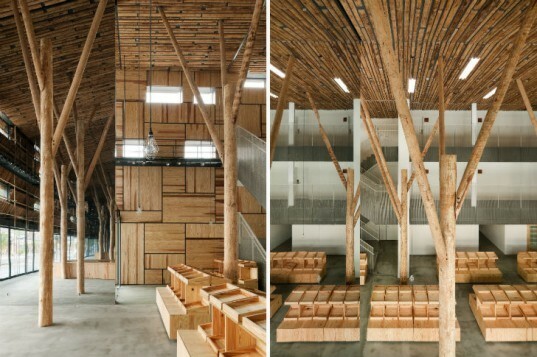 Yusuhara Machino-eki is a multi-purpose building by Kengo Kuma & Associates that combines a local produce market with a small boutique hotel. The town was known for its location along a main road used by Sakamoto Ryoma, a high-minded warrior of the region who contributed to the initiation of the Meiji Restoration (big political reform). Along this road there were a number of greenrooms called “Chad Do” for travelers, that served as cultural salons and where free tea was served. The Yusuhara Marche is an attempt to recreate that space where travelers and villagers could gather. Built using traditional materials like thatch, the market and hotel is directly inspired by the past, but with a distinctly modern design. Facing the street, the front curtain wall is built with modular thatch panels, tightly bunched together to create a solid wall of thatch. A deep overhanging roof will protect the thatch from rainfall and will ensure the facade lasts for a long time. These modular thatch panels are also built to pivot on a steel mullion so they can rotate and open the atrium up to the outdoors. Fresh air can move freely through the opened space. Inside, cedar logs are used as supports and the large open space is used by vendors to sell local produce. Walkways to the hotel rooms face out into the atrium. The back of the three-story building houses the 15 hotel rooms, which are simply furnished and naturally daylit. Simple, yet bright hotel room.